Where better to practice some crazy global strategies than in Ranked Fives? We ran two globals out of bottom lane with Pantheon and Lux, and then a Twisted Fate in mid lane. This gave us great potential for catching people out of position in the late game. The problem was the early game. I was laning against Malphite in mid lane which is the dumbest cheese strat I’ve ever seen. People honestly said “report Malphite for playing Malphite.” Honestly, go back to the shadow… of top lane. It was very annoying to eat his silly shard and get slowed only to see Udyr running out of the bushes. Before you can do anything you’re CC’d to death and Malphite walks away with full health. I swear, it doesn’t get much more annoying than that. Nidalee was giving our Cho’Gath a bit of a hard time, so we decided to swap lanes. 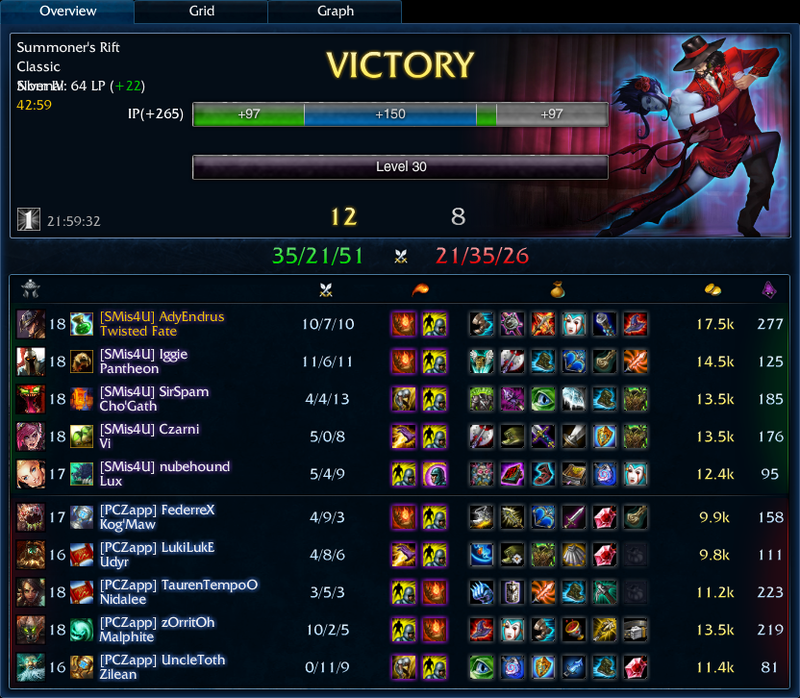 However, my global isn’t quite as global in top lane, so I was thrilled when I saw Nidalee switch back to mid lane. We ended up swapping lanes a bunch of times. Finally, we get to the good stuff! Late game we had so much fun. We got to just port in on people. If we timed it perfectly Jeff would be falling right behind where we were chasing and they wouldn’t be able to focus anyone. This worked surprisingly well. It was awesome to be able to dive one turret and know that your team could follow up because they could jump or laser further than we had already dove. One specific time I ulted to bot lane to gank Kog’Maw. I caught him before he could get to his turret. He was playing Kog’Maw without Cleanse so he deserved to die. I start to burst him and realize that I’m not going to finish him off, but a giant red circle opens up behind him. I turn and walk away. BOOM! Pantheon’s ultimate landing kills this poor Kog’Maw! It was like a scene out of the movies. I would include a screenshot, but League Replays is acting up with some of the Season Three changes. If I can get a replay to work I’ll include it. For now, this is the best I could do. 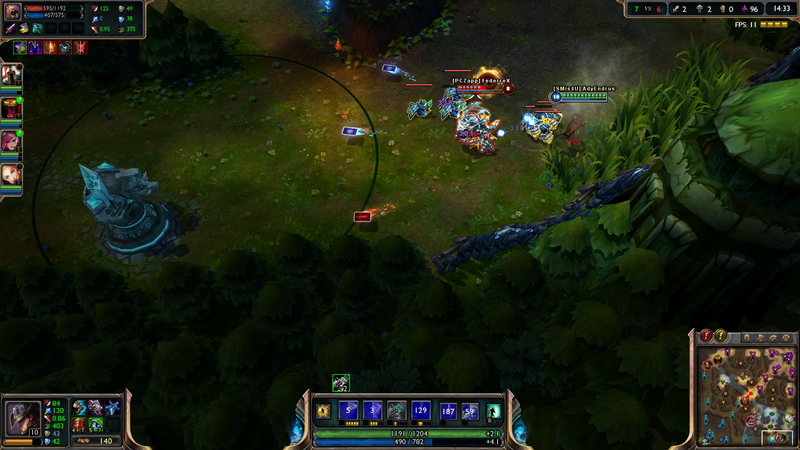 After this screenshot Kog burned Flash to be more directly below the middle of that circle. It was quite daring, and ultimately stupid. Most of my deaths were worthless. My last death especially. I was split-pushing bot lane and keeping Malphite from recalling. When the team fight broke out I stepped forward as quickly as I could but I wanted to stay out of Malphite’s ultimate range. I used Destiny to see the enemy team and saw that Malphite was making his way there quickly using what the Hungarians would call a “leg bus”, also know as “walking”. I try to beat him to the fight with my ultimate, but wind up rushing my Gate and watch as I teleport to the enemy base while the fight goes on right outside of it. I ended up burning my Flash just to get into the middle of a team fight! Needless to say, I didn’t last long.